This course incorporates the changes made under the IET Wiring Regulations Amendment 3. These regulations officially came into being in July 2015 and must be adhered by anyone involved with wiring installations. The 17th Edition training course Sheffield is a classroom-based training program with no practical elements. Taught by our experienced, professional tutors, our course closely follows the syllabus of City and Guilds 2382-15 and teaches students about the most important aspects of the IET Wiring Regulations. Also includes Part 2 Definitions, ‘Cmin’ Factor and Condition Reports. The 17th Edition Training Course Sheffield is an essential for anyone who will be working in environments that require a working knowledge of the IET Wiring Regulations. As this course incorporates Amendment 3, people already with a 17th edition qualification should also take this course to ensure they are up to date with the latest changes made to the regs. This course is an essential for progressing further in an electrical career. By attending this course, you have working knowledge of the 17th Edition Wiring Regs and can move on to other course routes such as training to become an electrical installer or a qualified electrical supervisor. All learners should buy, read and bring a copy of the 17th Edition Wiring Regulations with them. Ensure you’re working in compliance with the very latest changes to the IET Wiring Regulations with our 17th Edition Training Course Sheffield. Fully City and Guilds accredited, our 17th edition training incorporates the changes made under Amendment 3 of the Wiring Regs (2015) and is an essential course for electricians, electrical installers and anybody else involved at any stage with the installation of wiring in domestic, commercial and industrial properties. 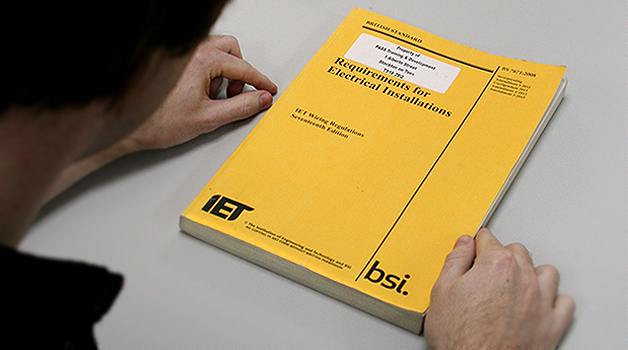 It’s recommended that those attending the course have a copy of the current Amendment 3 book of the IET Wiring Regulations. Note: Even if you have an existing 17th edition qualification before Amendment 3 was released, you must attend another course to ensure you’re up to date with the latest changes.